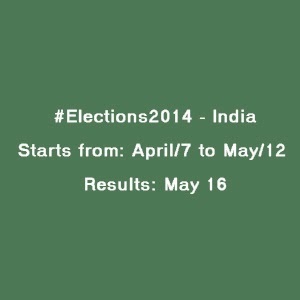 Dates of most awaited and upcoming Indain Loksabha Elections of 2014 are announced today on 5th March at 10 am sharply. Below is the full schedule of dates state wise. Future of Modi, Kejriwal and Rahul will lock in EVM on April 7 & will disclose on May 16. So keep go to Vote your favorite Party/MLA/Seat. India wants 100% voting.